The great thing about this series is that we're nowhere near running out of engines that were made by the millions, for decades. Ford's workhorse I6 racked up close to a quarter-century of front-line service, from 1960 to 1984. All early Econolines, most Falcons, and many Mustangs received Thriftpower motivation, and we mustn't forget all those Broncos, Granadas, Comets, and… well, this list would go on for quite a while. 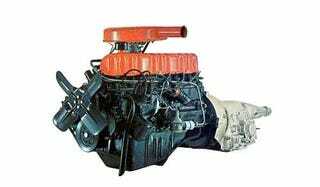 Ranging in displacement from 144 to 250 cubes (that's 2.4 to 4.1 liters to you Communist metric-system advocates), the pushrod Thriftpower didn't make huge quantities of power, but it got the job done for a whole generation of Ford drivers.